VAR's - Dying Breed or Key to Success in the Office 2.0 world? "I can make more money showing people how to use eBay"
This quote appeared a few days ago in the context of Microsoft's Online Services announcement, and highlights something that's been on my mind for a while - how's software distribution going to change in the Cloud Computing era, and more specifically, what the transition going to look like for the Value Added Resellers (VARs)/Integrators out there? Microsoft in particular has been very smart about using resellers. In fact they've built their empire in large thanks to the armies of resellers/integrators pushing and supporting its products. OS licenses, MSSQL, Sharepoint, Exchange, Remote Terminal Servers, MS Project, CRM, Accounting package - there are a lot of VARs who have made a nice living off of it for quite a while, and deservingly so - they allowed Microsoft to focus on software, taking on the labor-intensive task of selling and supporting the customer. Now, web-based software models have all but cut out the middlemen, going straight to the customer, offering aggressive pricing, leaving practically no room for anyone in the distribution chain to make a living. They did it of course not out of desire to kill off the VARs, but to please the customer, making the software more affordable. But is that a sound strategy, or is it going to result in undesired side effects? From my years on the SaaS front lines, one thing that we’d seen time and time again, was with so many choices thrown at them, with no authoritative partner to help them sort it out, customers become paralyzed with indecision. Another undesirable side effect is that there’s little outside help for the new system to succeed, and we all know that technology adoption is a windy road. Google is also starting to engage with sales partners for their Google Apps offering as evidenced by the Australia deal they recently announced - using SMS Management and Technology as their partner. However, aside from the 3 above, there are very few SaaS vendors that seem to have dedicated any attention to their partnership (channel) programs. Are you willing to pay them? What would you like the VAR to do for you? If you’re a VAR/consultant/integrator, what would you like to see from up-and-coming SaaS providers in terms of support and compensation? Microsoft for one has long understood the value of VAR channel in building the business. In fact they were one of the VAR friendliest hi-tech companies, which in my opinion attributed for a lion share of their success. These days Microsoft is having their own issues when it comes to VARs as they are transitioning into hosted services - first, they relied on resellers to host their solutions, now they are unequivocal about hosting themselves, and having VARs do sales, customization, migration, etc.. This leaves the VARs a smaller size of the pie, but it does make sense from the division of labor standpoint - let's face it, most VARs out there don't know much about hosting. At this week's Microsoft WPC conference Steve Ballmer had to re-enforce the realities of Microsoft's move into cloud services, online Exhange and SharePoint software -- Microsoft doesn't have any other choice, and yes, they're competing with their own hosting partners. That's the reality of web 2.0, cloud services, Software + Services, SaaS, and the like. Do it or lose it. Microsoft most move to this online model to stay relevant and not let others dominate, so it's tough nougies for hosters if Microsoft competes with partners. The partners' spin on this was that things aren't so bad. Many see the limitations of Microsoft's hosted solutions (customization be one of the biggest limitations) as John Fontana reports in his article. That may also be because Mircrosoft's online offerings are directed at smaller customers and not the enterprise. One partner quoted in John's article thinks this may also be about getting SharePoint into more users hands. Haven Computing CEO Rex Humston, who serves SMB's, says SharePoint isn't used much by smaller customers. It's not intuitive and easy enough for a low savvy user to configure and use. The key question in the hosted Online Software Services from Microsoft (Exchange & SharePoint for now) is who owns the relationship with the customer, partners or Microsoft. The answer: Microsoft. When Online Exchange and SharePoint is available this fall, customers will go to a Microsoft online software portal site to sign up for services with Microsoft. If the customer is working with a Microsoft partner, the customer will have to associate their purchase with that partner. That's how sign up for online software services will work on day one. Indications are that somewhere down the road, partners will be able to sign customers up themselves without the customer having to take those steps. Support is the other big question I've heard partners ask about. The net-net is calls from the customer's IT person will go to Microsoft. All other calls, from users and such, go to the partner. So, how do partners differentiate in the world of online software services from Microsoft? Microsoft suggests six areas of opportunity for partners: license sales (sell Microsoft's online software), deploy and migrate (help users get set up on online services and migrate from on premise software), customize (SharePoint designs, doc management and work flows), managed services (training, support, desktop management, desktop optimization, and business process management, new scenarios (same as managed services), and new segments (expand to customers you haven't been serving previously). I'd suggest there are also some others. ...SaaS is moving the traditional VAR's 'cheese' by taking away legacy revenue from day-to-day grunt work associated with on-premise software deployments. 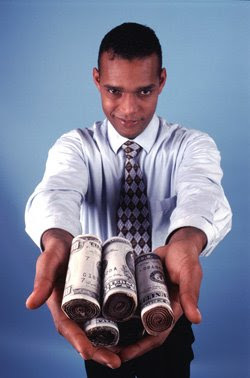 But the dollars are still there, and VARs that learn to be creative 'mice' will find out how to get them. SaaS creates the need for higher-end services that many VARs have traditionally offered, so there's a significant learning curve. The key, according to SaaS vendors, is for solution providers to intensely study their customer's business and figure out where to add value in the form of ongoing business consulting services. Pretty much everything we do involves project management. Projects take on different shapes and sizes, from a few tasks done by one person to 20 year NASA projects involving hundreds of thousands of pieces and people. Perhaps for that reason of having a variety of different projects types and sizes, project management has become one of the most contested domains in web applications (office 2.0 applications). I’ve already covered such formidable web PM applications as CentralDesktop and Basecamp in my previous posts. I’ve also received quite a few inquiries from the vendors in the past couple of months to review their solutions. While they all do a fine job at allowing one to document projects and manage tasks, most of them fall short of heavy-duty project management. When I say heavy-duty, I mean projects that have task dependencies, lots of uncertainties, shifting priorities, surprises (what is boringly called change management), resourcing issues, etc. 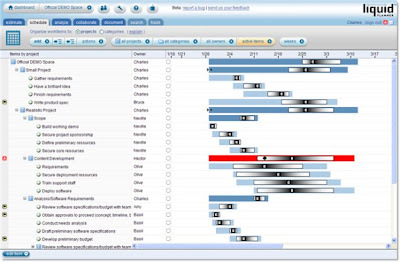 Best-of-breed project management systems like MS Project (IF USED RIGHT) are quite good at handling this dynamic, uncertainty-ridden challenge, however up until recently I have not seen a web app equivalent that approached complex project handling. That’s until I checked out LiquidPlanner. You can tell a system that’s been patched together by couple of engineers over couple of month’s worth of time from a system that’s been constructed by a dedicated team with good domain knowledge. Liquid Planner is one such fine system. From a very usable interface (separate post on that subject), to a very potent feature set, I believe they are the first formidable web app competitor to MS office. Work breakdown, task dependencies, estimation that includes uncertainties, resource leveling, schedule recalculation, - they’ve got it all covered. They are based up in Redmond (Microsoft land) and seem to have assembled a very capable management team – I would bet good money on them making it big. Oh, did I mention that their pricing model is also the right one for the web, with easy to start and scale pricing plans. – they’ve taken a very different route to project management. Actually, a very familiar one to most of us. They figured that most people manage everything with Excel (who said email was the killer app). So they’ve taken that paradigm and extended it to the project mgmt domain. 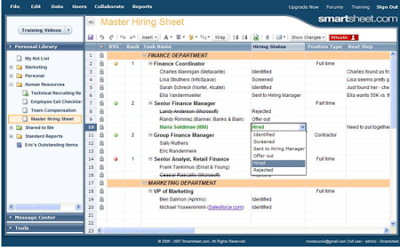 You start with a blank spreadsheet and start adding things to it just as you would with Excel, with the exception that the spreadsheets are smart and can link tasks to each other, link owners, send emails, etc.. Really a very innovative and very likely successful approach. I love both solutions and will be using them myself.